Vacseal® is a silicone based liquid resin system developed primarily for sealing leaks in high and UHV systems. Vacseal® will seal leaks as large as 4 micron liters per second on systems under evacuation. The sealant will repair larger leaks if the system is at atmospheric pressure. Weight loss and vapor pressure characteristics are truly outstanding. Vacseal® is extremely useful as a cement for sealing all kinds of optical windows and CRT glass to wire feed throughs. It will substantially reduce the IR reflectivity of metals and will produce higher emissivity levels for better heat transfer. The product can be used for the sealing of Brewster windows for lasers. And it can be used for more mundane applications such as the repairing of gauge tubes and also vacuum feed throughs. Vacseal, when sprayed on a surface, “dries” to a film that is optically transparent and exhibiting optical properties generally characteristic of clear silicone polymers. The use of this product almost always results in reduced downtime, in some cases eliminates the need for expensive “permanent” repairs, and on occasion has been known to save an experiment in progress (an argument for keeping some on hand, “just in case”). Vacseal® has major potential for application as an adhesive at cryogenic temperatures as well as good radiation resistance. The sealant’s durability will survive the environment of space without adverse effect on the product or the spacecraft itself. For vacuum systems, just about where there is any kind of a joint is a potential application for Vacseal. We are often times asked if Vacseal® is “qualified for use in space”. We wish we had a solid unambiguous answer to that question. Certainly, even after long periods of time, there is no weight loss of Vacseal. We have been told that Vacseal® currently is being used in space applications, such as on board satellites. We are told that it has been “approved” by some of the major firms in the aerospace industry and that it has been used on manned spacecraft. However, we do not have any specific documentation to which we could point where such usage has been documented. If you know of any such documentation, we would be greatly appreciative if you could share it with us, because we would be quite fast to put that additional information up for others to read and derive benefit. So in the mean time, if you are contemplating the use of Vacseal® in a space application, be sure you do the appropriate level of testing to make certain that Vacseal® would indeed work in your particular application. One can assume product use to be in the temperature range of -200 to 450°C. At or about 400°C, in air, Vacseal® will start to oxidize, ultimately leaving only a white powder, but in vacuum, where there is no oxygen, it can be expected to operate up to about 450°C. We do not recommend taking the material to such extremes, but we have been told that others have found success, even at those temperatures. As with any other materials selection, some amount of testing must be done on the customer’s end to validate that the product will indeed work in your specific application. We don’t want this to sound like a major disclaimer, but we feel we cannot over-stress the importance of the customer making the final decision as to suitability, a decision being the result of your own testing. The high temperature characteristics reported for Vacseal are possible because the product is a unique silicone and is not an epoxy or other organic based system which would degrade at far lower temperatures. Vacseal® has application as an adhesive at cryogenic temperatures as well as good radiation resistance. The sealant’s durability will survive the environment of space without adverse effect on the product or the spacecraft itself. The dried product will withstand repeated temperature cycling from liquid helium to 450°C. Vacseal® will adhere literally to everything…..except, as we like to say, “running water”. Obviously, there are differences in adhesion between different materials, but for the most part, the adhesion is quite good on virtually all solid surfaces. But again, we have not tested the adhesion parameters on different materials quantitatively, so if adhesion is an important issue, be sure you devise your own kind of system-specific test to make sure that Vacseal® is indeed going to be the appropriate solution for your particular application. 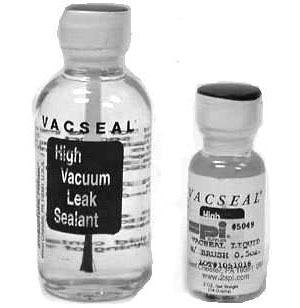 Just remember that Vacseal® was formulated to be a vacuum leak sealant, not specifically as an adhesive, but as we have learned over the years, a significant number of our customers are indeed using it as an adhesive. Unfortunately, because of the wide diversity of applications, we really don’t have further information on the use of Vacseal® as an adhesive. If you think you have such an application, we can only suggest that you might want to try it and after the appropriate testing, make some determination if it is the right “solution” for your specific case. Vacseal® has been used to make seals for hydrogen gas and it has also be used to contain liquid hydrogen. The real question though is now well it does do this and on that point we have difficulty giving an unambiguous answer. With any container there will be some kind of leak rate, and this is going to be no exception, but in at least some applications, the use of Vacseal® seems to be quite acceptable. Assuming the application is with a UHV (ultra high vacuum) system, and of course, the use of such joints in a UHV system is generally discouraged, in theory it could be used. Indeed Vacseal® has been used with threaded joints but not for UHV applications. The connection must be made “wet” and once the Vacseal® has started to cure, making the joint will become all that much more difficult, and the end result will probably be found to be less than satisfactory. The reason is that Vacseal® cures by evaporation of the solvent, yet some amount of solvent is required to make the polymer flow as a liquid into the crevices of the joint. High vacuum joints pose particularly frustrating issues, since the tendency is for the curing to begin at the outside and progress inward. The cured portion of the joint then acts as a barrier to the further evaporation of the solvent, and the result is that there is a very slow rate of solvent evaporation for a very long time, possibly years. Unlike other vacuum sealing products, the resulting polymer formed can be removed with a number of hydrocarbon solvents. The uncured polymer can be wiped away or otherwise removed with toluene, whereas the cured polymer requires something stronger, such as methyl ethyl ketone (MEK), or in extreme cases, methylene chloride. For applications not requiring high cleanliness, many common paint or lacquer thinners will work equally as well. However, common sense must always prevail, and if the Vacseal® is to be removed from a plastic substrate, for example, then some careful testing must be done first, in order to make sure that the solvent does not damage the underlying plastic. Various and expensive leak detection equipment can be used to find vacuum leaks. One “quick and dirty” solution which can be done in a matter of minutes and without spending a huge amount of money for an expensive leak detection system is to take advantage of the surface chemical properties of Liqui-Nox which can be used in conjunction with the easily understood “bubble test”. Vacseal® has a limited shelf life. On the shelf while still in unopened bottles, and being stored at room temperature and out of direct sunlight, the shelf life could be expected to be a minimum of three years. However the liquid product in quart cans has a shelf life of only three months. 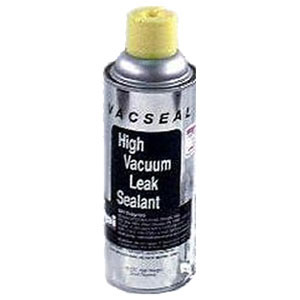 Hence be sure to give serious thought to the purchase Vacseal® in bulk quantities. Unless the product is destined for use almost immediately, we would recommend the purchase of the smaller bottles instead of the individual larger bottles or bulk cans. Shelf life of the product in aerosol cans is less than that in bottles.